Aboriginal Dance at the Barunga Festival. Barunga is four hours from Darwin. From island football to camels racing through the desert, we round up some of the Northern Territory’s most eclectic events for this year. 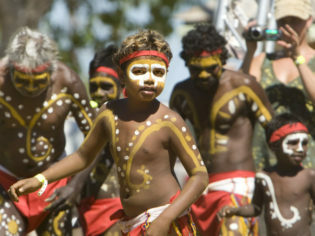 The Northern Territory’s calendar is full to the brim with out-of-the-box festivals and events. The dry winter season in particular brings celebrations galore, which reflect the larrikin nature of Territory life and share the rich culture and history of its indigenous communities. An NT event is often a once-in-a-lifetime experience, and good to keep in mind when planning your visit. The Tiwi Islands – a 30-minute plane ride north of Darwin – are famous for their art and football, both of which are showcased at the annual grand final and art sale. During the celebration, buses shuttle art lovers around the community, allowing them to gain an insight into the culture of the islands. Textiles, paintings and painted wooden birds are all on display and for sale at island prices. Meanwhile at the nearby footy field, on Bathurst Island, local teams face off in the grand final match, which draws attention from local and national media. It’s worth popping into the beautiful 1930s wooden church to learn about the early missionary days of the island. Planes and ferries run to Bathurst Island from Darwin all day. If camping and car racing are your jam, you won’t want to miss the Finke Desert Race, one of the toughest off-road courses in one of the most remote places in the world. Bikes, buggies, cars and quads battle it out in a two-day race from Alice Springs to the community of Aputula (Finke). The pre-race scrutineering is worth a look, and the start/finish line is the place to be when the action begins on the Sunday morning. Camping is allowed anywhere along the 220-kilometre course for a gold coin donation, and about 12,000 people settle in under the stars over the four days of the event. 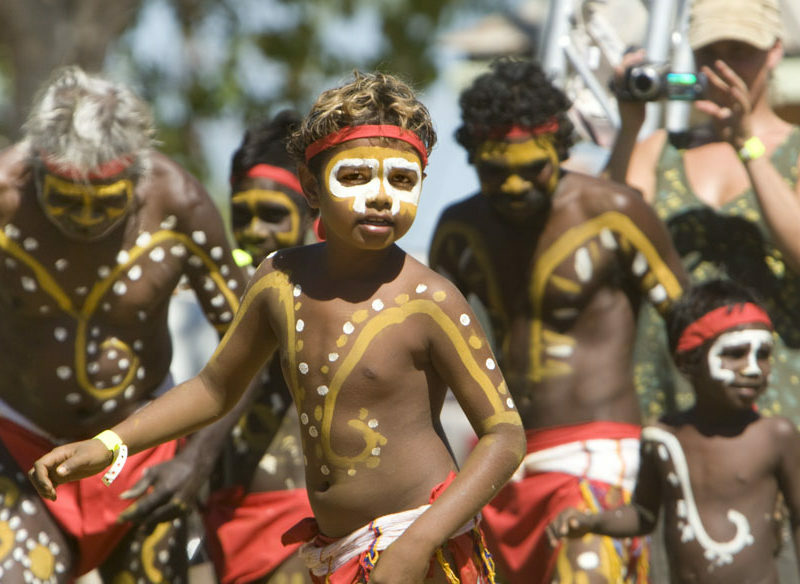 Now in its 32nd year, Barunga is Australia’s oldest and largest remote-community festival. Combining music, sport, art and culture, the three-day event is known for attracting high-profile artists: Geoffrey Gurrumul Yunipingu, John Butler, Courtney Barnett and Paul Kelly have all featured on the bill. A visit to Barunga, four hours from Darwin (40 minutes out of Katherine), is an opportunity to immerse yourself in a thriving indigenous community and experience the highlights of the Katherine region. Expect traditional dance (bungul), didgeridoo, spear-throwing, football games and a wild Friday-night school disco. In 1997, the Beanie Festival was a simple affair, showcasing a small range of knitted hats crocheted by aboriginal women from central Australian communities. Twenty years later it involves 500 beanie makers, 7000 beanies and 150 volunteers. This community celebration of the humble headwear revolves around a beanie-making competition, exhibition and workshops, all held at Araluen Arts Centre in Alice Springs. Don’t miss the drop-in workshops held by local artists throughout the festival. Beginning in 1974 as a way to clear the local area of rubbish, the Beer Can Regatta has evolved into a hilarious day of races where vessels made from beer cans compete in the shallow waters of Darwin’s Mindil Beach. Have a bite to eat at the famous Sunset Market before getting into a tug of war, sandcastle-building and thong-throwing. All proceeds go to charity. Known as the Melbourne Cup for camels, the long-running Camel Cup draws thousands of spectators to Alice Springs for a day of dromedary racing in the only purpose-built camel-racing venue in the southern hemisphere. With an opening parade, market stalls and fashions on the field competitions, it’s guaranteed to be a quirky day out. Imagine 50,000 colourful solar-powered lights illuminating the central Australian desert. That’s the beauty behind a visually spectacular art installation at Uluru by artist Bruce Munro, which has been named ‘Tili Wiru Tjuta Nyakutjaku’ or ‘looking at lots of beautiful lights’ in local Pitjantjatjara. The award-winning Field of Light – which offers a hypercolour display across a space the size of four football fields – was so popular in 2016, it has been extended for another season.